Humbly and gratefully I stand before you today and seek the influence of the Holy Spirit to give witness to my message. “Hearken, O ye people of my church, saith the voice of him who dwells on high, and whose eyes are upon all men; yea, verily I say: Hearken ye people from afar; and ye that are upon the islands of the sea, listen together. “For verily the voice of the Lord is unto all men, and there is none to escape. Today I shall speak doctrine, by way of warning and of testimony, and shall do so as one holding the holy apostleship, whose responsibility it is to proclaim the Lord’s message in all the world and to all people. Each of my brethren of the Council of the Twelve has the same responsibility I have to declare these things to the world and to bear record of them before all men. 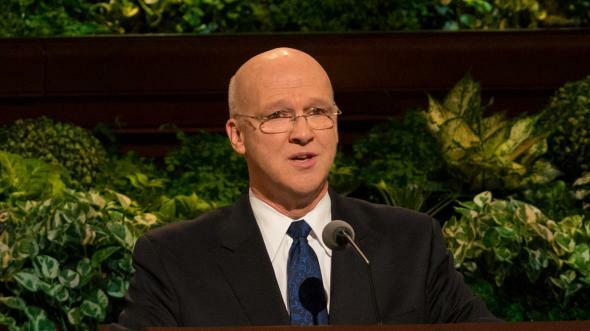 “Make a solemn proclamation of my gospel … to all the kings of the world, to the four corners thereof … and to all nations of the earth.” (D&C 124:2–3.) He was to invite them to come to the light of truth, and use their means to build up the kingdom of God on earth. “That the kingdom of God has come: as has been predicted by ancient prophets, and prayed for in all ages; even that kingdom which shall fill the whole earth, and shall stand for ever. “The great Eloheem … has been pleased once more to speak from the heavens: and also to commune with man upon the earth, by means of open visions, and by the ministration of Holy Messengers. “By this means the great and eternal High Priesthood, after the Order of His Son, even the Apostleship, has been restored; or, returned to the earth. “This High Priesthood, or Apostleship, holds the keys of the kingdom of God, and power to bind on earth that which shall be bound in heaven; and to loose on earth that which shall be loosed in heaven. And, in fine, to do, and to administer in all things pertaining to the ordinances, organization, government and direction of the kingdom of God. “Being established in these last days for the restoration of all things spoken by the prophets since the world began; and in order to prepare the way for the coming of the Son of Man. “And we now bear witness that his coming is near at hand; and not many years hence, the nations and their kings shall see him coming in the clouds of heaven with power and great glory. “In order to meet this great event there must needs be a preparation. “Therefore we send unto you with authority from on high, and command you all to repent and humble yourselves as little children, before the majesty of the Holy One; and come unto Jesus [Christ] with a broken heart and a contrite spirit; and be baptized in his name, for the remission of sins (that is, be buried in the water in the likeness of his burial and rise again to newness of life, in the likeness of his resurrection), and you shall receive the gift of the Holy Spirit, through the laying on of the hands of the Apostles and elders, of this great and last dispensation of mercy to man. “This Spirit shall bear witness to you, of the truth of our testimony; and shall enlighten your minds, and be in you as the spirit of prophecy and revelation. It shall bring things past to your understanding and remembrance; and shall show you things to come. 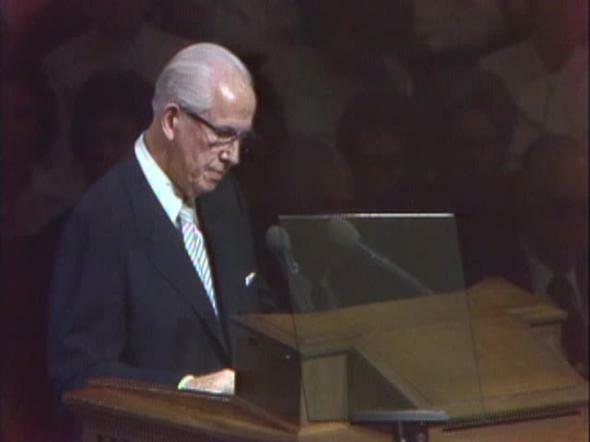 “By the light of this Spirit, received through the ministration of the ordinances—by the power and authority of the Holy Apostleship and Priesthood, you will be enabled to understand, and to be the children of light; and thus be prepared to escape all the things that are coming on the earth, and so stand before the Son of Man. It seems fitting and proper to me that we should reaffirm the great truths pronounced in this declaration and that we should proclaim them anew to the world. 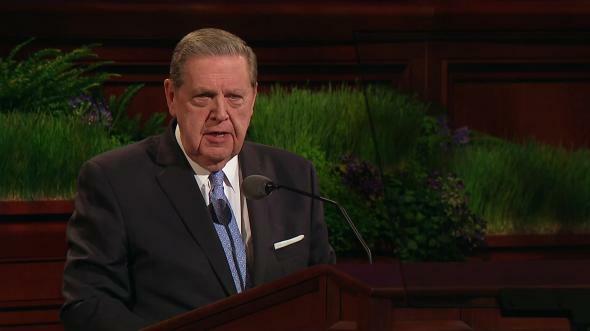 To the rulers and peoples of all nations, we solemnly declare again that the God of heaven has established his latter-day kingdom upon the earth in fulfillment of prophecies. Holy angels have again communed with men on the earth. God has again revealed himself from heaven and restored to the earth his holy priesthood with power to administer in all the sacred ordinances necessary for the exaltation of his children. His church has been reestablished among men with all the spiritual gifts enjoyed anciently. All this is done in preparation for Christ’s second coming. The great and dreadful day of the Lord is near at hand. In preparation for this great event and as a means of escaping the impending judgments, inspired messengers have gone, and are now going, forth to the nations of the earth carrying this testimony and warning. The nations of the earth continue in their sinful and unrighteous ways. Much of the unbounded knowledge with which men have been blessed has been used to destroy mankind instead of to bless the children of men as the Lord intended. Two great world wars, with fruitless efforts at lasting peace, are solemn evidence that peace has been taken from the earth because of the wickedness of the people. Nations cannot endure in sin. They will be broken up but the kingdom of God will endure forever. Therefore, as humble servants of the Lord, we call upon the leaders of nations to humble themselves before God, to seek his inspiration and guidance. We call upon rulers and people alike to repent of their evil ways. Turn unto the Lord, seek his forgiveness, and unite yourselves in humility with his kingdom. There is no other way. If you will do this, your sins will be blotted out, peace will come and remain, and you will become a part of the kingdom of God in preparation for Christ’s second coming. But if you refuse to repent or to accept the testimony of his inspired messengers and unite yourselves with God’s kingdom, then the terrible judgments and calamities promised the wicked will be yours. The Lord in his mercy has provided a way of escape. The voice of warning is to all people by the mouths of his servants. If this voice is not heeded, the angels of destruction will increasingly go forth, and the chastening hand of Almighty God will be felt upon the nations, as decreed, until a full end thereof will be the result. Wars, devastation, and untold suffering will be your lot except you turn unto the Lord in humble repentance. Destruction, even more terrible and far-reaching than attended the last great war, will come with certainty unless rulers and people alike repent and cease their evil and godless ways. God will not be mocked. He will not permit the sins of sexual immorality, secret murderous combinations, the killing of the unborn, and disregard for all his holy commandments and the messages of his servants to go unheeded without grievous punishments for such wickedness. The nations of the world cannot endure in sin. The way of escape is clear. The immutable laws of God remain steadfastly in the heavens above. When men and nations refuse to abide by them, the penalty must follow. They will be wasted away. Sin demands punishment. “We say, then, in life or in death, in bonds or free, that the great God has spoken in this age.—And we know it. 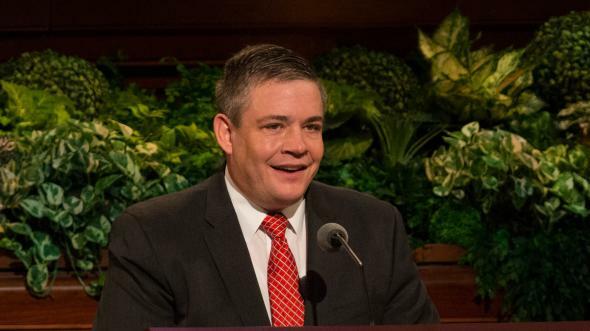 “He has given us the Holy Priesthood and Apostleship, and the keys of the kingdom of God, to bring about the restoration of all things as promised by the holy prophets of old.—And we know it. “He has revealed the origin and the Records of the aboriginal tribes of America, and their future destiny.—And we know it. 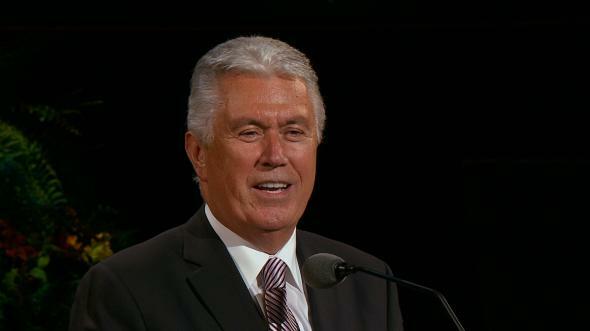 “He has revealed the fulness of the gospel, with its gifts, blessings, and ordinances.—And we know it. “He has commanded us to bear witness of it, first to the Gentiles, and then to the remnants of Israel and the Jews.—And we know it. “He has also said that, if they do not repent, and come to the knowledge of the truth, … and also put away all murder, lying, pride, priestcraft, whoredom, and secret abomination, they shall soon perish from the earth, and be cast down to hell.—And we know it. 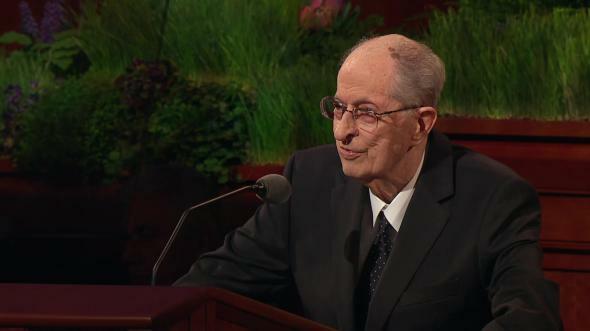 “He has said, that when … the gospel in all its fulness [is] preached to all nations for a witness and testimony, He will come, and all Saints with him, to reign on the earth one thousand years.—And we know it. “He has said that he will not come in his glory and destroy the wicked, till these warnings were given and these preparations were made for his reception.—And we know it. “Heaven and earth shall pass away, but not one jot or tittle of his revealed word shall fail to be fulfilled. Now there remains but one thing more for me to do today, and that is to bear my personal testimony. I know that God lives, that he is a personal being, the Father of our spirits, and that he loves his children and hears and answers their righteous prayers. I know that it is his will that his children be happy. It is his desire to bless us all. I know that Jesus Christ is the Son of God, our Elder Brother, the very Creator and Redeemer of the world. I know that God has again established his kingdom on the earth in fulfillment of prophecy and that it will never be overcome, but it shall ultimately hold universal dominion in the earth and Jesus Christ shall reign as its King forever. 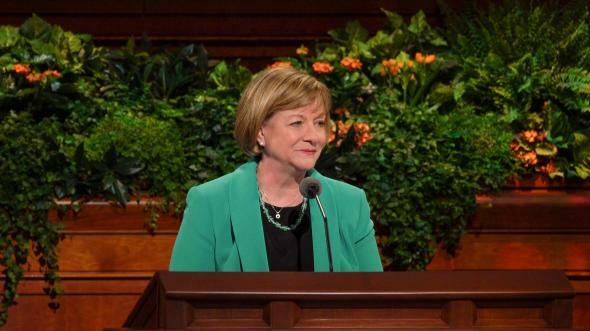 I know that God in his goodness has again revealed himself from the heavens and that Joseph Smith was called of God to reestablish that kingdom—The Church of Jesus Christ of Latter-day Saints. 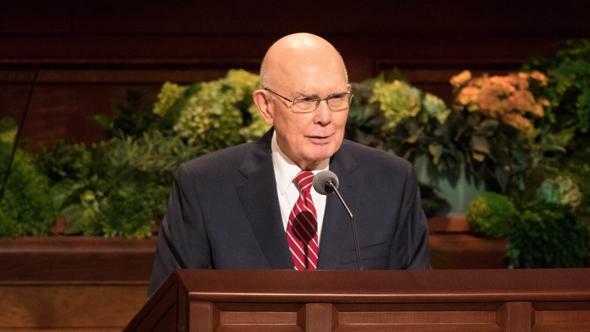 I testify that he accomplished this work, that he laid the foundations and that he committed to the Church the keys and powers to continue the great Latter-day work, which he began under the direction of Almighty God. I know that Joseph Smith, although slain as a martyr to the truth, still lives and that as head of this dispensation—the greatest of all gospel dispensations—he will continue so to stand throughout the eternities to come. He is a prophet of God, a seer, and a revelator, as are his successors. I know that the inspiration of the Lord is directing the Church today because I have felt of its power. 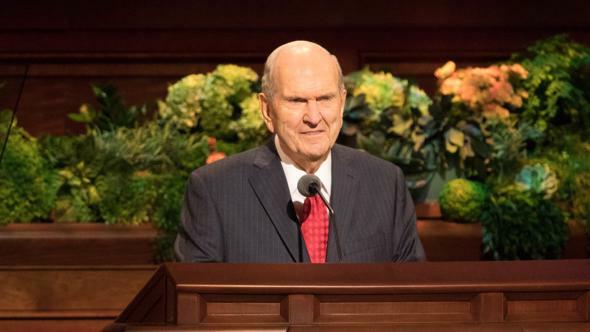 I know that the First Presidency and other General Authorities of the Church have as their object and purpose the glory of God and the exaltation of his children. And finally, I know that no person who does not receive this work can be saved in the celestial kingdom of God and escape the condemnation of the Judge of us all. Humbly and prayerfully I leave this testimony, knowing full well I must eventually meet my Maker and stand with all men before the judgment bar of God. 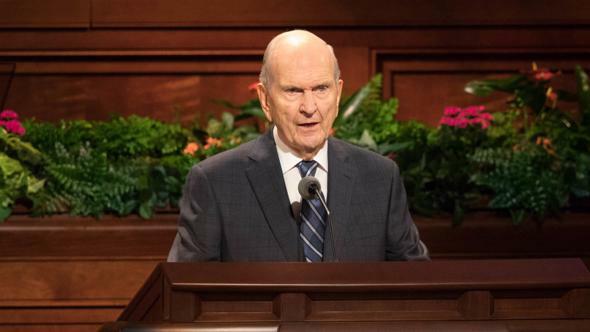 More than anything else in all the world, I am grateful for this testimony of the divinity of this great latter-day work and exhort all men everywhere to give heed thereto, in the name of Jesus Christ. Amen.